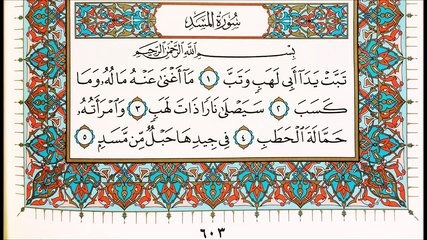 Arabic text of Surah 111. Interpretative paradigms of the Qur’an can mainly be sorted into two main families, which we would name “Islamisation” and “Biblisation”, both within Muslim and non-Muslim scholarly traditions. The “Islamisation” paradigm consists in accessing the Qur’an only or mainly through late 8th and 9th literature (sîra, Sunna, and asbâb al-nuzûl) whose actual factuality is seldomly called into question. As a result, we read the Qur’an through an “Islamic” glance, which is actually a later construct. The “Biblisation” paradigm, on the other hand, consists in embedding the Qur’an in the larger landscape of Revealed books, in particular the Torah and the Gospels, transforming the Qur’an in some sequel, a remainder of a long Revelation process, which could not be understood outside of the context of the earlier Books (a good example of this approach can be found here). The consequence, in both cases, is that the actual society in which the Qur’an was revealed and Muhammad has been operating is completely obliterated or is made irrelevant. Understanding the Qur’an in its context becomes therefore much more difficult and drives hermeneutists to miss deeper or sometimes more obvious meanings of concepts, words, verses and surahs [ One of the many examples of such obvious meanings lost in a translation process that does not take into account the society of the Qur’an is the translation of kâfir by “disbeliever”. In Qur’an (57,20), Jacques Berques translates the word kuffâr into french “dénégateurs” (unbelievers) when the more adequate meaning with regard to the context is “plowmen”. This meaning is clouded by a later theological enwrapment of the word kufr. Unwrapping what is theological to go back to the original meaning i.e. what it meant for the society back then is the essence of our approach. The paradigm we use to approach Surah 111 strives to reconstruct the segmental/tribal society in which the Qur’an was revealed, starting from the only tangible and factual artifact we have from this period: the Qur’an and its very specific lexicon. Words are like boxes, archeological treasures, which we need to unpack until we reach their most concrete, basic meanings: those used in a tribal, nomadic society, living the in Arabia and characterized by paucity and constant struggle for life. The Qur’an was supposed to be meaningful for these people in this very specific socio-historical and geographical context. Rendering life to this society, reconstructing their imaginary is a safe track to grasp the meaning of many Qur’anic patterns that had remained particularly abstruse for a long time. Because we were not approaching them through the eyes, ears, minds and imaginaries of the people of the Qur’anic time and society, but through the eyes, ears, minds and imaginaries of people who wrote about them centuries later. Including ourselves. What’s more, it can be argued that the choice of one of the two paradigms mentioned earlier leads to very different starting points. In the Islamisation paradigm, the starting matter is one of orthodoxy: how are we supposed to understand the Qur’an according to an authorized set of texts. In the Biblisation paradigm, the starting matter is one of deconstruction : what kind of biblical material can be identified behind the Qur’an viewed as a biblical subtext. In the paradigm we want to present here, the starting matter is neither one of orthodoxy nor one of deconstruction but rather one of rebuilding. In this paradigm, the Qur’anic material is not presupposed to be an extension of biblical and parabiblical narratives but a witness of a set of anthropological manifestations that are clouded by the distance between us and the society that received the Qur’an as a contemporary phenomenon. Such distance was already prominent by the time the Islamic Tradition was formed and thus the Mufasirûn faced the same problem as we do today, making the Islamisation paradigm a tricky one without the proper anthropological tools to discriminate between what is relevant in the Tradition and what is more or less clearly a product of the 9th century and later. That is not to say that no biblical material may enlight given passages of the Qur’an or that the Tradition is ultimately and systematically wrong, but any biblical insight or any late interpretation can only be relevant in light of an Arabic imaginary which has its specificities and originality that we propose to unravel. As you shall see below, exercised on one of the shortest Surahs, this approach is already bringing interesting elements to life, therefore contributing to the rebuilding of the “Qur’anic imaginary”. We will be publishing soon on key Qur’anic concepts such as “Imân”, “Kufr”, etc. (1) May the hands of the ruby colored (man) [Abû Lâhab] be parched and may he parch himself (on his feet) (2) His wealth will serve him nothing and neither will what he has acquired (3) He will be exposed to a high flamed fire (4) And his wife will have to (go fetch and) bring wood (like a slave) (5) A fiber rope around her neck. “Ruby colored” could mean “of a shining beauty”. We would even rather use the word “fop” since the expression is meant to be unkind. In Lisân Al-Arab we find the following excerpt: “Abû Lahab was a kunya (kunya meaning here: a nickname) given to one of Muhammad’s paternal uncles (a’mâm an-nabî). He was given this nickname for his beauty (kuniya Abû Lahab li-jamâli-hi)”. Therefore, in the this context, Abû Lahab should be translated into the one with ruby cheeks or ruby complexion. Indeed, the Luhba (same root “LHB” as Lahab) means the shiny color of the skin (Ishrâq al-lawn) when compared to a bright flame. The first meaning of lahab is a “pure smokeless light which rises from the night camps and enlightens people with a positive connotation”. From the flame which stands straight we can also draw the meaning Lihb, the “abrupt side of a mountain which cannot be climbed and looks like a straight wall”. In the Surah 111, there is a play on words about lahab, the good looking man with a ruby complexion and the fact that he will be exposed without protection to the (solar) flame (lahab), the word lahab recovering its real meaning. This understanding of lahab needs to be correlated to another description of (solar) hell meant to be terrifying in 77, 31 with the image of solar fire as a flame as high as a fort, qasr, meaning here the forts around the oases, some of which could still be found in Arabia (see on the internet photographs of old forts in Khaybar oasis). In the tribal culture, the hand is a sign of might and power, especially since the hand of powerful tribe men is the organ with which they donate and create debtors. It could also be the hand as the symbol of an agreed upon alliance. It is no mere coincidence that the hand is mentioned in cases of alliance with the divine. The divine hand grants the human alliance between Muhammad and those who join him in Q. 48:10. God’s hand stands above those who came to show allegiance, bay’a, during the Medina period. Q. 5:64 curses the Jews, Al-Yahûd who pretend that God’s hand will be closed, maghlûqa (except for them) whereas the divine discourse ceaselessly boasts the divine generosity to which human beings owe everything. This allegation of the Jews stands as a polemic for a shameless lie. The response is prompt in the same verse: “No, His hands, (those of Allah) are wide open (mabsûtatân) and he spends (yanfiqu) as much as he wants since he possesses everything and represents the limitless ability to give. In an extremely succinct way, the Qur’an depicts the call for malediction on a man of beauty and power in his society by focusing on two of its attributes: physical and symbolic. This verse suggests that no human wealth could be compared to the divine one and that a man, as rich as he may be, will lose everything in the Hereafter when he faces God. Abû Lahab (the fob) could be considered as a famous personality in Mecca at that time: rich, good-looker and intriguer. The call for his punishment looks therefore extremely harsh in that context. The “high flamed fire” consists in fact in a burning solar heat without shade or protection in the perspective of a divine judgment which sends him to hell. This is a metaphor of a summertime desert sun which could in fact be translated by a high flame of a blaze, if we wanted to decrypt the image). The violence of the Qur’anic speech counter-balances the tribal violence against Muhammad, as Abû Lahab seeks to banish him from his parental group, which was the worst sanction possible for a tribe man. It meant basically no resources, no support, no protection, i.e. becoming a “nobody”. This verse clearly demonstrates that we are dealing with an act of relegation into the desert in the worst conditions imaginable for a tribe man and, moreover for a sedentary man since his high ranked wife is destined to a slave’s fate: gathering roots and small wood for the camp fire. This noble lady is thus promised to a supreme degradation and to a total loss of her statute. This confirms that the “Lahab” of verse 3 does not refer to a metaphorical or otherworldly inferno, but to a very concrete reality: the burning fire of the desert under the sun, coupled with the social relegation and loss of hierarchical position for the Abû Lahab’s. Jacques Berque thinks of mockery and he may be right; in which case we should translate: “(Her only ornament) would be the fiber rope she wears around her neck”, instead of the jewelry she is supposed to have worn as woman of high social rank in the Meccan society. However, we could think of alternatives where the last verse of the surah could complete the image of the verse 4, around the carrying of wood. Indeed, we can find on the internet pictures from the Red Sea coast of Yemen, where women carry incredible loads and especially wood. The burden is in fact retained by a fiber rope, except that it is tightened around the forehead. Conclusion: reading a Surah in its historical context. Confronted to this Surah which is actually replete with references to the struggles of Muhammad with his society in Mecca, is it possible to keep on claiming that the Qur’an is a “text without context” as it is sometimes learnedly affirmed? There is indeed, in this passage, an eschatological vision of a biblical origin in its principle: the idea an infernal punishment. But that is it. Through the play of words, the understanding of the functioning of a tribal society, the historical elements we can know about the unfolding of the preaching of Muhammad, we understand that the Qur’anic inferno is actually describing the very concrete desert of Arabia, adding social dereliction on its top. In that sense, the idea of infernal punishment is not just borrowed from the Bible, but is actually “coranized”, i.e. mobilizing an imaginary relevant to the Meccan society. This tends to disqualify the hypothesis that scribes, unfamiliar to the Meccan context at the beginning of the 7th century AD would have been drafting the Qur’an in its entirety: the imaginary and the references called upon in this Surah are too specific and “local” to have been drafted by individuals writing in another time and place. That does not mean that we buy into the traditional idea that the Qur’an is the exact and total replica of Muhammad’s preaching in Mecca; our paradigm can on the contrary counter such a claim by identifying anthropological discontinuities inside the Qur’an itself thus setting an additional tool to detect later interpolations. In the end, our paradigm is one that could well be used as a regulating tool for other approaches in addition to its own merits that we quickly showed here. * Rachid Benzine is an associate researcher at l’Observatoire du Religieux (IEP Aix en Provence). In the latest installment of the Review of Qur’anic Research 2, no. 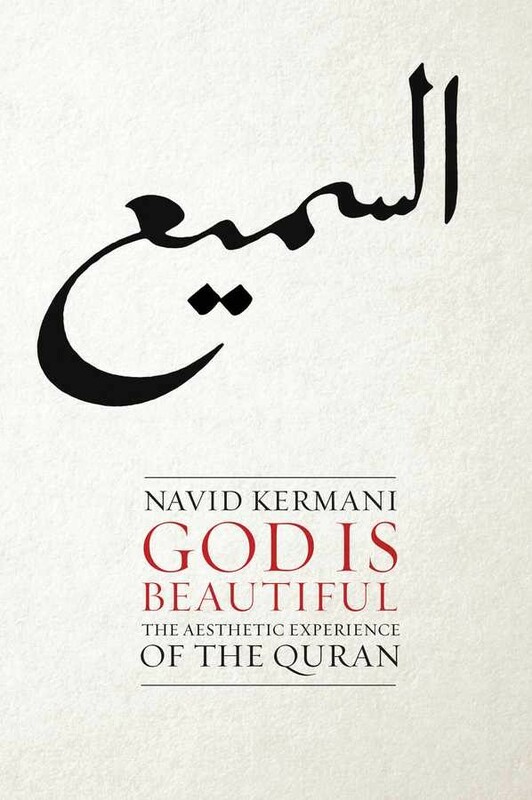 3, Lauren E. Osborne reviews Navid Kermani’s God is Beautiful: The Aesthetic Experience of the Quran (Malden, Mass. : Polity, 2015). In this book, Kermani argues that the aesthetic experience of the Qurʾan has always been linked to understanding the text as a whole since its initial reception. This aesthetic experience is mainly focused on the hearing. Through his analysis, Kermani brings an innovative hermeneutic strategy to Qur’anic studies. His work also provides an innovative way of analyzing early accounts of the reception of the Qur’an. His work covers close readings of an impressive number of sources, bringing into focus an essential aspect of experiencing the Qur’an.